I walk the dusty streets from Vajra Varahi Health Clinic to a small Newari village most mornings. My interpreter and I wind through alleys full of interested street dogs. We cut through schoolyards where uniformed children gather on their way to learn and we pass through fields where women look up from their chores to utter a quiet "Namaste". I wonder silently to myself on these walks - Will her smile be bigger today? Will her spirits be lifted? Will today be the day when she finally wiggles her toes? I make this walk to treat an 81 year old beloved mother, grandmother, wife, and stroke survivor. The stroke happened just over a month ago leaving her paralyzed on her left side. I squeeze into the makeshift treatment room next to my patient as she cautiously sits upright. My interpreter relays my questions and the patient's responses from just outside the room where he kneels on the cold, hardpacked dirt floor. My patient leans against one of her daughters, the one who takes charge of her mother's home care. The daughter always greets me with a big smile, she helps with treatment by encouraging her mother and making jokes to lift her spirits. My patient's husband often comes as well to sit with his wife if there is space. A few grandchildren, ranging in age from four to twenty, peer over my interpreter's shoulder. The makeshift room smells musty in the chilly brick home; its walls are plywood, there are wooden shutters for windows, the family has hung tarps to block the cold-wind from seeping through the cracks. My patient lays swaddled in layers of blankets, tucked into her tiny space to keep her warm. Most mornings her progress report is the same: "She sat outside in the sun yesterday. We massaged her arm and legs just like you said. Yes, she's doing her exercises every day." On good days I hear, "She walked two steps on her own today. She sat upright by herself for a bit." On difficult days the patient asks, "Why do I feel so heavy? I am so tired. When will I be better? I want to walk with my goats again. I have to get better soon for my family." I thought I learned in school how to treat stroke sequella with acupuncture. Work with the Yang Ming channels, use the e-stim machine, stimulate the scalp points while the patient tries to move their limbs. The treatment protocol is the easy part. What I didn't learn was how to be a coach and cheerleader. I precariously try to balance those tasks while I struggle to manage the patient's expectations. Every day I dread answering the question, "When will my mother be better again? We are doing everything that you have asked of us." I can't give them an answer to that question when I don't know the answer myself. She may slowly improve over time with frequent treatments and continued exercises at home, but then again she may not. 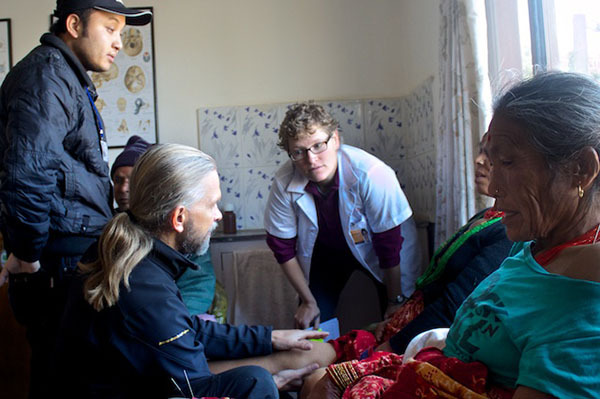 What I do know is that it will take months of dedicated work from the patient, her family, and from us, the practitioners, for her to regain mobility. But there is no guarantee. The changes are painfully slow. Both the the patient and her family have a hard time seeing any change at all. It is my job to remind them with every visit. "You're doing great! Wiggle those toes, even if they don't move, just keep trying! Look, you just moved your foot!" I tell them she is doing better, that I can see her improvements. I remind them to be patient, to stay positive, to keep trying. But I say these words to the family as much as I say them to myself. Be patient, Stephanie, real change takes time. Stay positive, don't give up hope. Keep trying, keep encouraging her, she needs to know that she is getting better. Just keep treating. So I walk the dusty streets from Vajra Varahi Health Clinic to a small Newari village most mornings to see my patient, and I wonder silently to myself on these walks - Will her smile be bigger today? Will her spirits be lifted? Will today be the day when she finally wiggles her toes? Today, after four weeks of treatment, was the day that she wiggled her toes.